Public Service Minister Elias Kapavore officially launches the District Training Rollout. 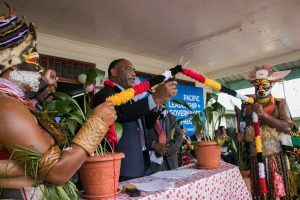 The Papua New Guinea Institute of Public Administration (PNGIPA) launched the District Training Roll-out in Ialibu-Pangia District, Southern Highlands. The launch of the District Training Roll-out coincided with the commencement of the PNGIPA Project Management short course for district-level public servants. More than 30 public servants from District Development Authorities attendeded the course, including participants from the districts of Ialibu-Pangia, Nawaeb (Morobe), Nuku (West Sepik), Sohe (Northern) and Talasea (West New Britain). The course was supported by the Pacific Leadership and Governance Precinct, a partnership between the Governments of Papua New Guinea and Australia to support the development of ethical, capable public-sector leaders. Public Service Minister Elias Kapavore said the PNGIPA and Precinct programs reach out to public servants across Papua New Guinea to provide them with tools to be more efficient and effective in their work. “To meet our objectives as a nation we must have a culture of excellence and inspirational leadership in the public sector,” Mr Kapavore said. Australian High Commissioner Bruce Davis addresses the crowd who gathered at the Ialibu-Pangia District Headquarters. 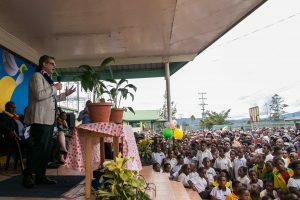 Australian High Commissioner Bruce Davis said that providing regional public servants with opportunities to develop their technical capabilities and leadership skills was a priority of the PNG-Australia Partnership. “Public servants take responsibility for the delivery of vital services in every corner of the country,” Mr Davis said. Secretary for Department of Personnel Management, John Kali also said public servants on the ground carry the reputation of the government. “There’s no magic about it – we want to give public servants the tools to serve our people in the Districts and Local Level Governments. The course is being co-delivered by Papua New Guinean and Australian trainers, as part of PNGIPA’s Precinct partnership with the Australian Public Service Commission. In 2017, more than 200 public servants from the provinces and districts took part in Precinct courses.